Paul threatening Elle that he'll get his company back. Lou trying to find out the truth about why Harold has come back. Dan admitting to Sam that he doesn't want to leave Libby. Harold and Lou go into the kitchen to talk in private. Harold is forced to explain in his own circumlocutory manner that he has met "lady people" on his travels and done something he isn't proud of. Despite various suggestions of what this misdeed could be, Harold won't say any more and foists Lou off onto a customer. She serves Elle quickly, with Paul insisting that it is put on his tab, before attending to the more important task of getting to the bottom of Harold's sordid affairs. Elle is not willing to be civil to Paul after his harsh words to her and refuses to succumb to his apologies, knowing that he has the ulterior motive of regaining his assets. He disputes that she has the right to decide what's best for him and still intends to get his business back, with or without her help. Paul wants legal help from Toadie, but he would rather he made an appointment and leave him to lunch in peace. Toadie has a very large workload considering Sam is sick, so refuses. Angry at the lack of help Toadie's offering, Paul leaves. Toadie's next visitor is Fitzy, who is there to give Toadie next month's rent and to tell him that he and Sam are leaving to go to New Zealand. Toadie is keen to have a party, but Dan would prefer to leave quietly. DAN: Maybe you could say goodbye to anyone I might happen to miss? TOADIE: Anyone in particular? Libby deserves better than that, mate. DAN: I know, I know, I just don't like goodbyes. Toadie turns down the money and recommends that in order to leave Erinsborough without any regrets, he needs to talk to Libby. Harold is back in an apron to help Lou out, although he has divulged no further secrets. Harold offers to pop in every now and again to do a shift, something Lou didn't expect of the lone traveller. Karl and Susan happily tell Ringo and Zeke that they managed to convince the hospital to let Susan take part in the drug trials. Ringo gets up to go to the counter, whilst Susan asks Zeke to help monitor her progress on the trial, so that if he sees any negative signs she can immediately stop. She freely admits that she is sucking up and that she'd even grovel. Zeke seems to take it reasonably. Dan arrives and apologetically interrupts to say sorry to Ringo and Zeke for over-reacting and to let them all know that he and Sam will be leaving Erinsborough for New Zealand that day. They agree that they will miss each other. Ringo thanks Dan for helping him when he was in trouble and they shake hands, promising to keep in touch. As Zeke and Ringo leave for class, Susan suggests that Dan joins them to say goodbye to his colleagues. He declines, using the cold reception from Helen Carr upon his resignation as an excuse. The boys are keen for him to come because he's a popular teacher, so Dan leaves with them, followed by a questioning look from Susan. Ringo and Zeke arrive to class, apologising to Libby for being late. She refuses the private word that Zeke requests. Libby is about to start the lesson when she sees Dan outside. Cue the sexual-tension-sign-post music. DAN: Sorry to interrupt, I just wanted to say goodbye ... to the kids. Libby gazes at him across the room and looks devastated to hear that he and his wife are leaving for New Zealand on a spur of the moment decision. The kids say that they'll miss him and it seems they're not the only ones, although Libby simply wishes him a good flight. Apparently unwillingly, he leaves. Libby turns to the board and attempts to regain some composure. She shakily asks Declan a question about the text they're studying, "Mao's Last Dancer". Zeke steps in to explain how the character's love of dance is communicated to the reader, whilst Libby reminisces about her dancing with Dan. She looks flustered and runs out of the classroom, with only a cursory command that they start reading. She runs towards the car, just as Dan gets in it. Seeing Libby in the mirror, Sam quickly drives away. Libby puts her hand to her face in affliction as she sees Dan head away from her. Apart from he's only got as far as Ramsay Street, where he is regretting not being able to say a proper goodbye to everyone. 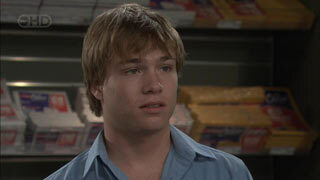 He tells Sam that she didn't speak to Libby properly because she was in the middle of a class. Sam admits that she ran out of school as they drove off, but she thought they'd already spoken to each other. Dan suddenly has some brief and wistful flashbacks of Libby's face, though insisting to Sam that he wants to leave with her. SAM: Well, then let her go. Zeke and Ringo are simultaneously washing up and discussing Fitzy's departure. Susan is reading the instructions of her pills: to take two three times a day. Libby encourages Ben to play safely and gives him a hug. Susan gets Libby to give her a hug as well, checking that she's ok.
Dan arrives to speak to Libby and Susan gathers the family in her own inimitably unsubtle style to leave them in peace. When they're alone, Dan apologises, but Libby is being as self-sacrificing as ever, ostensibly encouraging marital fidelity at all costs. He reminds her that she deserves to be happy too, before saying that he has to leave. DAN: You're a catch, Libby Kennedy. Someone out there is a very lucky man. The tears imply that this wasn't quite the romantic sentiment she was hoping for. Ooh, slow-mo with atmospheric musical backing ahead. Dan strides, as much as one can when slowed down, out of the house. Libby follows, but stops under the arch, watching Dan pen the door of the taxi, before slamming the door and turning back to face her. She takes a few steps forward and then they run and embrace each other. She buries her head in him. Still slow-motion, they gaze at each other, framing Sam, who is watching behind, looking both heart-broken and angry. Paul finds Elle in her usual office to tell her that he's moving back home. She lets him know that she's not impressed that he's trying to find a lawyer. Despite this, he's keen to start over. Elle maintains a frosty reception and packs up her things. ELLE: You don't remember what money and power did to you. PAUL: I will not abuse it this time, Elle; I'm not that person anymore. Elle is disbelieving. She wants to keep her dad, so won't give in to his demands or let him move back in whilst he's still intent on proving her wrong. Dan brings a load of magazines, a guide to New Zealand and an eye-mask over to Sam. She kisses him spontaneously. He eagerly talks of living arrangements in New Zealand, but she reminds him that they haven't even got on the plane yet. With five minutes left before boarding, she nips off to the toilet. She watches Dan through the window as she goes, looking torn. Seemingly Sam has been in the toilet a long time - there is an announcement of the final boarding call for the flight to New Zealand (what, is there only one airport there?). Dan gets up and asks a woman coming out of the toilet if Sam was in there. She tells him it was just her and Dan looks worried. He rings her, but cannot get through. There is an urgent announcement for customers Daniel and Samantha Fitzgerald. Libby is surprised to see Sam, considering she's supposed to be on a plane. SAM: Dan was willing to change his whole life for me. Wave goodbye to everything he loved: his home, his job, his friends ... you. She tells Libby she can't stay very long because he must be on his way back from the airport by now and Libby realises that she's left him. Libby is concerned that abandoning Dan again will destroy him, but Sam knows that he will have Libby. LIBBY: He wants you! He chose you! SAM: He chose our marriage. I can't ever give him what you can. SAM: I can't keep looking into his eyes knowing that he's thinking of you. LIBBY: If you leave, he'll feel like he failed; he'll never get over it. Sam thinks she's the one who has failed, but Libby is still convinced that Dan will never be able to move on. She pleas with Sam not to do this again, but Sam won't change her mind. She gives Libby an envelope to pass on to him and asks her to look after him. Defeated, Libby agrees. SAM: (voice-over) I'm sorry Dan. When I asked you to come away with me, I was clinging to the hope that we could put everything behind us and start again, but I was asking the impossible. I've realised that our marriage is broken, it can never be fixed. I've decided to step out of your life so you can find the happiness that you deserve. If you can find it in your heart to do one last thing for me, then do this: don't come after me. (We see Sam being driven off in a taxi) You have everything you need right here in Ramsay Street. We're travelling different paths now. Dan, I want you to follow yours with the knowledge that I will never forget you. (Sam cries in the taxi) Just find the strength to put me in your past and courage to face a brand new future. I love you Dan. Dan cries folds away the letter. He picks up the envelope and takes out the contents - divorce papers. Libby watches behind as he puts his head in his hands and sobs.